Tutorials on how to get thins done on Android devices, most of the time , HTC devices in general. Maybe some of you want to know how to set up your computer to start developing for Android. I will cover to set up Eclipse and downloading the Android SDK. In order to start developing for Android you need the Software Development Kit. You can download it for Windows, Linux or for Mac OS X. Once downloaded you have to install it, on Windows just start the executable file. The Java Development Kit is needed to develop Android applications since Android is based on Java and XML. Writing Android code is being done using an editor, the best supported ,and in my opinion, the best one around is Eclipse. Eclipse is an opensource freeware editor that is capable of supporting a wide range of programming languages. 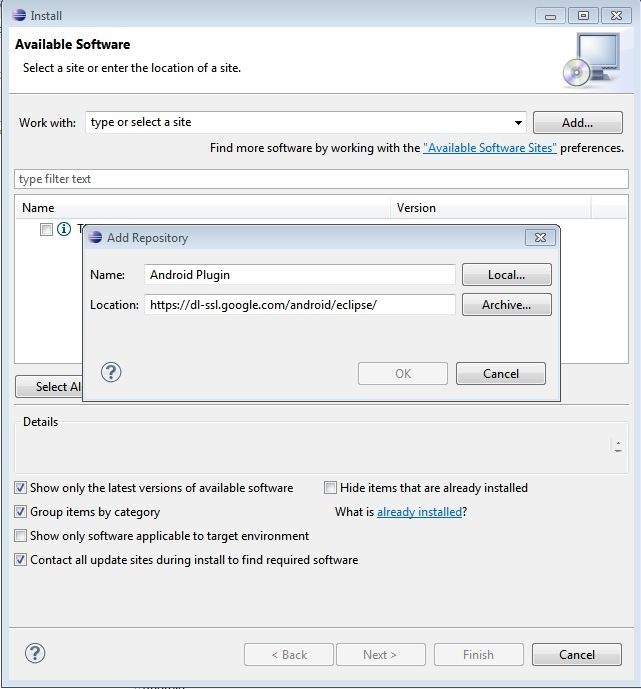 Once Eclipse is installed we need to connect the Android SDK with Eclipse, this is being done by the ADT Plugin. Installing this plugin is easily done using eclipse. Start Eclipse. Navigate in the menu to Help > Install new software..
Click ‘Ok’. Make sure the checkbox for Developer Tools is selected and click “Next”. Click ‘Next’. Accept al the license agreements, click ‘Finish’ and restart Eclipse. Click apply and you’re ready and ok ! On windows, start the SDKManager.exe . Located in C:\Program Files (x86)\Android\android-sdk and install all platforms and components. You’re ready to start coding now ! Any problems , comment below ! Why rooting your HTC device? – and a lot more tweaks..
– People who installed the Froyo update on the Wildfire can’t use unrevoked at this time, they’re still working on this. So it only works with Eclair at the moment. Unrevoked3 can also be used to flash another custom recovery than Clockworkmod Recovery. – First download unrevoked3 here : http://unrevoked.com/ It’s available for Linux, Windows and Mac OS X. – Before we begin : Windows users have to uninstall HTC Sync and download the Hboot drivers. A more specific tutorial here. – I’ll explain this now further for Linux Ubuntu , download the package : reflasg.tar.gz and copy the script ‘reflash’ to your home folder. – Follow the instructions on screen . DON’T forget to enable USB Debugging on your phone! – Congratz, you have now a rooted HTC device! Well, you now have super User permission and unrevoked installed clockwork recovery , with this clockwork you can flash a custom rom. I’ll write a tutorial for this soon. I am not responsible for bricking or messing up your phone, you do this at your own risk. But it’s nearly impossible to brick a HTC device, if you have questions don’t hesitate to comment below. If you do mess up your phone and point your finger at me, I may and probably will laugh at you. PS : Stay tuned for a tutorial on how to flash a custom ROM. I am also developping my own sense and froyo based ROM , called ImPrOS , it will be available soon.